No matter what you're creating, you have likely felt the air of inertia that comes with any creative project. You start a new creative project feeling super inspired to get whatever is going on in your head into whatever medium it’s intended for. You can see a clear view of what you want and you feel over-the-moon excited to achieve it. Then, as more effort is required, inertia shifts gear. Your goal seems to move further, and further away or perhaps other exciting projects become more enticing and you pivot. I totally get you. I've done it too. This can happen in any area of our lives: our health, body, business, work, hobbies, relationships, and even spirituality. 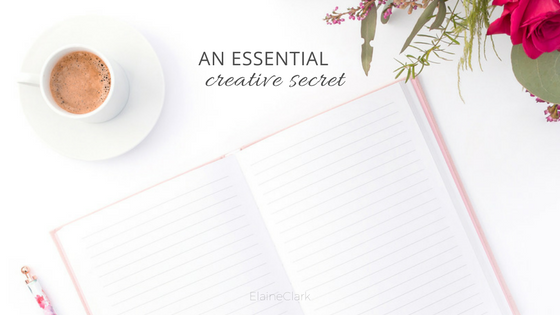 It's been a struggle for me, and that's why I want to share with you this creative secret that's really worth holding onto. Throughout the creative process, inertia is something virtually every creative fem will face. Rather than giving-in to it, try this instead. Focus on your passion process, not the outcome. If you're creating anything at all, heck, even multiple things at once, an unhealthy obsession with the outcome may only scale down your momentum. Obsessing over the outcome will constantly remind you of the hundreds, or even thousands of steps that are between you and your goal, and it may start to veer you off track. When we focus on the process, it makes whatever it is we are doing more enjoyable. It frees up our mental energy, which would otherwise be wasted in worry, stress, resistance and stagnation. Passion process keeps us moving forward with baby steps. It encourages us to take micro shifts towards our growth and development. It allows us to get a taste of the concentration and joy that comes with being in the flow. Studies have explored the differences between people who are process-oriented versus those who are goal-focused. It turns out that process-oriented individuals end up achieving more than the goal-focused individuals, and they often report less effort and more joy throughout the process too. The truth of the creative process is that creating anything at all takes on a life of it's own. And It can't be forced. The biggest disappointments are when we slow down half way through, lose interest or quit because it's too hard. So, as you go on to create, I would love for you to harness that fierce and harmonious energy in you to stay in your flow. Give your full attention to what you're creating and watch it evolve. It's so much more effective to direct our energy towards the deep and important work we are doing rather than obsessing over the end result ― which we don't fully have control over. I hope this serves as lil' nudge to stay on track. Stay open and keep creating with big bold heart.